November 11, 2017, Clearwater, FL – Pairing one of the Fall Classic’s best hitters with a former MLB Silver Slugger Award winner is a difficult combination to beat. Just ask the Tampa Blue Jays. 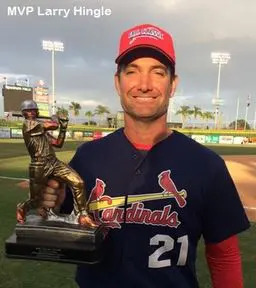 East Coast Cardinals first baseman Larry Hingle parlayed extensive batting cage work with former MLB hitting star and teammate Dante Bichette into a 4-for-5 effort with four doubles, two RBI and four runs scored in a runaway 45 National Fall Classic championship game victory. For the left-hitting first baseman from Orlando, the title game performance was nothing more than the benefits of playing with such a talented team and a lot of work in the batting cage. Hingle likened his approach in the cage and during the game as an attempt to mimic the swings of MLB greats Ted Williams and Barry Bonds. Against the Blue Jays, the tournament MVP produced a performance even he can’t remember duplicating. “I’ve had some games where I smoked the ball a few times,” he said, “but today the goal was to square up every pitch wherever they threw it. In a game like today, it feels like it’s happening in slow motion. Like the bat swings itself.” Hingle doubled leading off the second and fourth, was intentionally walked in the sixth, then doubled again in the seventh and eighth. His only out was a hard hit ball to second that ended the top of the ninth. Still, despite the lopsided score, Tampa manager David Castro admitted the outcome could have been far worse for his club. EC left six runners on base during the first four innings before finally breaking through with a run in the fifth and a 1-0 lead on Kiko Garcia’s run-scoring single to right. Then, sensing they’d allowed Tampa to hang around long enough, the Cardinals broke the game wide open. Ten batters, six runs and five hits later, EC’s lead was a dominating 7-0. Chad Sanders led off with a single to left and moved to second on a wild pitch before just beating the throw to the plate on Danny Cuff’s single to center. A walk and infield hit made the score 3-0, helped loaded the bases and set the stage for the biggest at-bat of the game. Third baseman Chris Reeder laced a three-run double down the left field line for a six-run lead, before scoring on Rey Gallagher’s sacrifice fly to left to make it 7-0. After a Hingle double and Danny Cuff single made it 8-0 an inning later, the Cardinals solidified the rout in the eighth. Twelve EC batters came to the plate with nine reaching base and seven scoring. When the onslaught was finally over, the Cardinals led 15-0 and it was just a matter of counting down the final outs. It wasn’t until the ninth that a glimmer of infallibility befell the Cardinals when a walk, single and error played the Blue Jays’ lone run. For Hash, another week in Florida ended in another title and another opportunity to share the moment with the players who’ve played such a central role in his life for so long. It’s no wonder he notes that winning never gets old. EC finished round-robin play just 3-2, including a 4-1 loss to Tampa, before defeating the defending champion Monarchs 4-3 to reach the final. The Blue Jays fared better in round-robin play, going 4-1, then scored a ninth-inning run to top the Chicago-Brooklyn Royals 8-7 in the semifinals. WP: Benedict. LP: Reyes. 2B: Hinkle 4, Reeder (EC). Pitching: Benedict and Branz (EC). Reyes, Lugo (6) Vasquez (8), J. Delgado (8) and P. Copcecion.